When our grandparents were born listening to recorded music or broadcasts was most often done as a group, gathered around a gramophone or a radio as headphones were something for the audiophile or sound technician. Nowadays, even the cheapest mobile phone comes with a set of small headphones known as earbuds. Personalized listening to music or the soundtrack of games and movies using portable devices has become ubiquitous. Children see their parents using mp3 players or mobile phones and want the same. However, young ears are not the same as adults as they need to be protected from the intense sound that could damage them, and lead to deafness in later life. In this article, we are going to look at how to choose a set of headphones for your child, and pick out some of the best currently available on the market. If you are sitting in a room with someone wearing a pair of headphones, it’s challenging to gauge how loud is the sound they are hearing. Compared to quality hi-fi speakers or the sound system you see at a rock concert the headphones look very small and harmless. What matters is how much the eardrums vibrate due to the sound. Most headphones can produce sound levels much higher than the most potent studio speakers, and well above acceptable safety limits. Often people pop on a pair of headphones because they do not want to disturb others, not realizing their ears are experiencing sound at extremely high volumes. A test with an iPod Nano at full volume playing a pop album for about an hour gave an average sound reading of 96 decibels, that is almost as loud as standing close to the speaker stack in a disco, and is much higher than the sound level in an average workplace. So as a parent don’t be deceived, even though you might not be able to hear what your child is listening to wearing headphones, it can still be pretty loud, and at times damaging to their hearing. There are two types of hearing loss induced by noise. Sudden loud bursts of noise, such as explosions from guns and explosives, or even fireworks, can cause temporary or long-term hearing loss in children and adults alike. The other type is the continuous exposure to loud noise over an extended period of time. This time of hearing damage is mostly associated with the working in a noisy environment without ear protection, or being subjected to loud sounds such as amplified music over a number of years. An Australian government study found that a quarter of people using portable audio devices daily were exposed to high enough noises to cause hearing damage over the long term. In the Netherlands, a study discovered that almost all adolescents were listening to music from mp3 players with earphones, and almost half were at levels high enough to cause hearing damage. Only seven percent of the youngsters were using a noise limiter. The children’s hospital in Boston has researched listening levels and found that listening an hour a day at 60% volume is relatively safe. Continuous exposure to noise over many years is key to hearing loss or impairment in children and adults. The advent of the Walkman in the early 80s and the subsequent boom in mp3 players in the last twenty years has sparked concern as headphones, and earbuds deliver sound directly at or into the ear. Because all headphones have a degree of electrical resistance, they can attenuate the volume of sound coming from a typical personal sound device. The higher the resistance, the lower the sound volume attainable from any specific machine. Hence, matching the right headphones to a player can stop hearing damage from occurring. Studies have shown that high sound levels, on a regular or daily basis, over an extended period of time will cause some hearing damage. Even though some people have ‘tougher’ ears than others, it’s difficult to tell who until any damage has been inflicted to their hearing. Even though we can distinguish speech from music from noise, eardrum itself does not, as it is the brain that processes the sound. So listening to loud music, or speech can be just as detrimental as standing in the middle of a noisy work environment. America’s National Institute on Deafness calculates that approximately 28 million Americans have some form of hearing loss. There are 17 out of 1,000 children under the age of 18 affected. Although there has been lots of research into the hearing loss due to noise in adults, there has been little research into how loud noises affect children. Hearing is affected by loud noises as they damage the hair cells of the cochlea. When exposed for a short time to a very loud noise people experience what is called the ‘temporary threshold shift,’ which means a temporary loss of hearing, usually accompanied by ringing in the ears known as tinnitus. If the hair cells are permanently damaged, then this can lead to permanent hearing loss of some degree. How Does Loud Noise Affect Children? There have been a number of studies on how children are affected by loud noise from many parts of the world. In broad terms, the studies conclude pre-schoolers, and schoolchildren can be changed in four different ways. Kids can show one or all of these symptoms. Hearing impairment. Young children are likely to be more susceptible to hearing loss from loud noise than adults. Clinical studies with mice show that after just four days of exposure to loud music the animals had a marked loss in the number of cochlear hairs inside the ear. The loss of hairs is directly related to hearing loss. Stress-related somatic A noisy environment can increase the stress levels in children, which in turn is having a somatic impact on their bodies, increasing hormone levels, and blood pressure. Cognitive effects. The stress response to loud sounds in children can also have a psychological impact. As with adults children respond differently, some can find loud noises terrifying, while others take it in their stride. Acoustic shock, what’s that I hear you say? Well, acoustic shock usually occurs when there has been some electrical stimulation to the hearing that can come from a short-lived high voltage in a headset of a telephone or headphones. The resulting acoustic shock can temporarily or permanently disturb the functioning of the ear or nervous system. Headset manufacturers are aware of the problem and have active and passive ways to stop acoustic shock happening. The active control requires powered circuitry to process signals to the headset. Passive or power-free solutions are now making themselves more available in products to protect listeners. Passive control responds directly to high sound pressure and is recommended for children as there is no need for a power source, and can take a lot of day-to-day punishment. These types of headphones can attenuate the loud sounds by as much as 27 decibels, which is enough to avoid most circumstances of acoustic shock. How Concerned Should I Be With My Child Using Headphones? For adults choosing a pair of headphones often comes down to price and sound quality, and the effect they have on our hearing is not a concern. However, for growing children, it is much more of a worry. Kids have hearing that is much more acute than their parents. Some kids set the ringtone on their phone at frequencies many adults cannot hear. They can do this because their hearing is still developing, and they have not been subjected to the loud noises of everyday life as much. So we should be taking all reasonable precautions to protect our kids’ hearing for as long as possible. One recent report suggested that by 2060 over half the population of the United States would have such bad hearing they would be classified as deaf. The study put it down to too many people listening to volumes that are far too high. The latest noise-canceling headphones do not help. They block out the sound surrounding the listener, enclosing the ears with sound, which makes the force against the eardrums greater, and increasing the chances of hearing damage. We’ve already talked about how hearing is affected by loud noise, and how headphones or ear buds can make the problem more acute. Unfortunately, you are not going to stop your kids wanting to listen to music using a personal audio device. So it’s best to get them something that you will be comfortable knowing they are as protected from hearing damage as possible. You cannot go wrong by first explaining to your kids about the dangers of loud noises, and how it can affect their hearing. Music concerts and surround sound systems at movie theaters can have sound levels of 100 decibels. It may be loud and fun, but your kids need to understand it can cause long-term damage to their hearing. If you take them to the movies, ask them afterward about their hearing. If the picture was very loud, then their hearing can be muffled and indistinct for a few hours afterward. This would be a good time to talk about listening to high volumes, and what could be considered safe listening, and explaining that turning the music down can be just as much fun. Some so-called experts will say that it never safe for children to listen with headphones or earbuds, but that is not the case. Consider airline pilots who wear headphones for hours on end, and they still have an acute sense of hearing, so why not children. However, research has discovered that the risk of hearing loss to children and adults increases if you wear headphones for more than two hours per day. The researchers were quick to point out that this did not mean wearing them for two hours, and then taking them off for a spell, and then using them again for two hours. Instead, it was a total of two hours in any day. It is a good idea for your kids to lower the volume of their listening with headphones, and also to limit the time they were them. Experts in child hearing and development say that the length of listening with headphones can have a detrimental effect on a child’s hearing even at low levels, so use should be carefully monitored by a parent. All these warnings may make you think that your child should never wear headphones, well we all know that is not going to happen. Like ice cream, chocolate, and all our indulgences moderation is the key. What Is a Safe Volume Level? 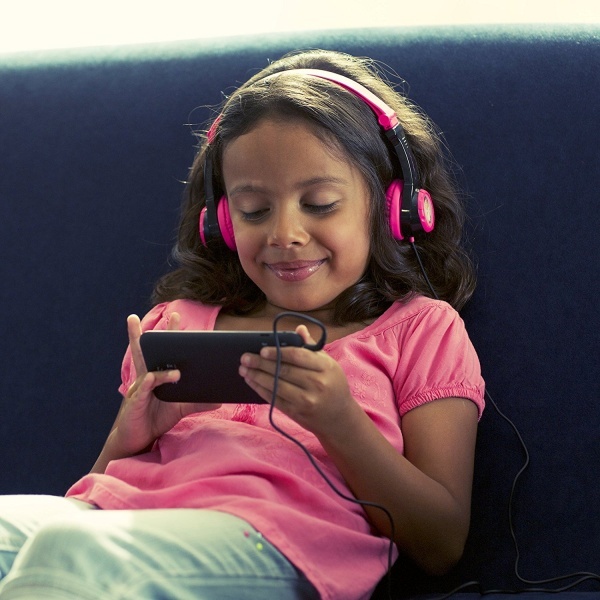 The World Health Organization (WHO) and other leading health authorities have set out guidelines on what can be considered the maximum volume a child should be subject to when listening to a personal audio device. The WHO considers 85 decibels as safe, whereas the US Centers for Disease Control (CDC) has a lower level at just 70 decibels. The 85-decibel level set by WHO is based on the effect on adults, however, the CDC points out that children have a lower threshold to damage, and have thus based their figure lower. When listening to 70 decibels, any surrounding sound will not be drowned out by what you are hearing. However, at 85 decibels the surrounding sounds are usually sufficiently muted. This is often the reason for turning up the volume on headphones. Earbuds are not going to improve the situation, as although they drown out surrounding sounds, the source of the noise is much closer to the eardrum, and thence the volume can be so much higher, and thus cause as much damage as headphones. Headphones for kids often come with an attenuation switch that can limit the maximum volume produced. Nowadays this is not necessarily a physical switch and is more often software which is password protected so parents can then set the highest listening volume for their child. What Else Should You Consider When Buying Headphones for a Child? As with a lot of things you buy for the kids, it’s essential to choose stuff they are going to use. Otherwise, it is a waste of money. Ask yourself if your child is really going to get any use out of the headphones, and will they take the punishment your youngster is likely to give them? You will have to balance budget and durability to see if it is worth spending the money. Headphones are a bit like clothes, and there is no one-size-fits-all for kids like there are for adults. You have to take into account the size of the earpieces, and the size of the headband to see if they fit your child. Just like buying clothes for your child, even though it says it will fit a recommended age then it might not be accurate for your kid. Think of the times you have bought something for your child to wear on recommended size, only to find when you get it home it’s either too big or too small. Good retailers will allow you to try the headphones on your child before buying to check they are the right size and fit. Look for headphone earpieces which cover the ear snugly. The headband should have enough expansion to allow for growth and be not too stiff that it presses hard on the ears. Try and look for headphones which are lighter to wear. Any weight on the head can cause neck ache, and other problems if used over an extended time. 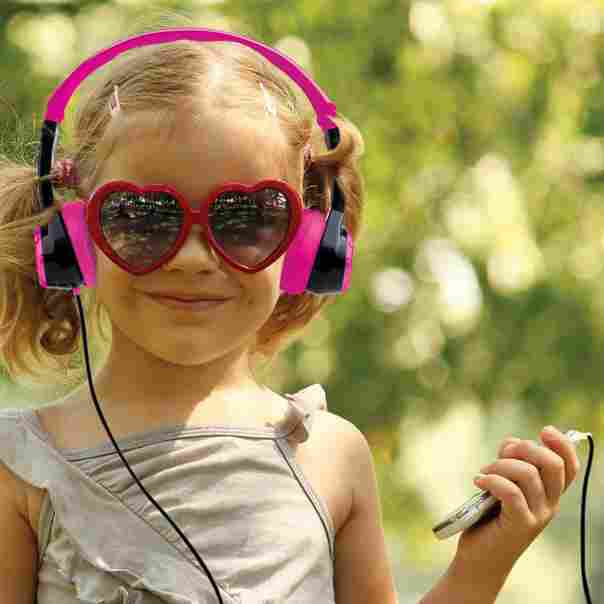 The higher sound quality headphones are generally designed for older children. They are also likely to be the more expensive but are also more durable. We have compiled details of a series of tests involving children who have had a chance to get hands-on with a range of headphones and picked out those they liked the best. They have also all be subject to audio tests to see if they are too loud for young ears. Adult headphones tend to be much louder than those designed for kids. Premium quality adult headphones can have a peak volume of 115 decibels which is like a jet fighter taking off and is far too loud for any child to be subjected to for any length of time. Most headphones designed for children we looked at are limited to 85 decibels in line with the World Health Organization standard we talked about earlier. If you decide to purchase a pair of headphones without the restrictor, then it will require trust between you and your child that they are not playing music too loud. We also considered the length of the cable, or if a cable is really necessary as Bluetooth options are becoming increasingly available. Ideally, we were looking for headphones that had excellent sound quality, and kept the noise inside the headpieces, without having a volume high enough to cause hearing damage. 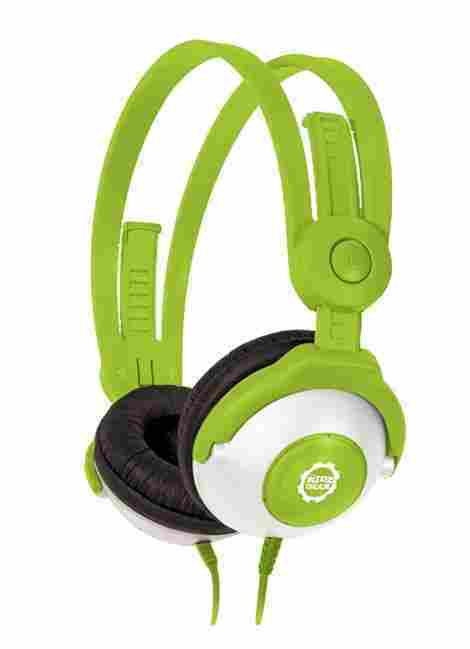 Without a doubt the best kids headphones available at the time of writing. The kids love them and reviewers across the internet have gone wild about them. During tests, the Puro Sound Labs Kids Bluetooth headphones were ranked highly in just about every area we looked at. Comfortable and well made, with a superb sound these headphones have proved a great hit. The limiter does not need to be set by a software app or computer as it is pre-installed to give a maximum volume of 85 decibels, and works when the headphones are being used wirelessly with Bluetooth or wired. The ear cups give excellent sound isolation even though they do not have any active noise-canceling electronics. After problems with the reliability of the previous plastic headband, the makers have replaced it with a much more sturdy aluminum one. The headphones come with a carrying case to protect them when not being used. 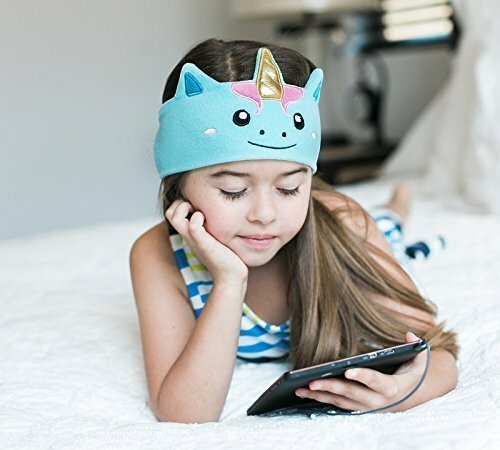 The flexibility of the headband means these headphones can be used for toddlers up to teens, even adults with small heads should be able to use them. Needless to say, the soft plush earpieces feel very comfortable, and are sized to fit over-the-ear for smaller ears and on-the-ear on larger ones. The Puro Sound Labs Kids headphones come in a range of five color combinations, from the standard black, through white/silver, blue and purple, to the version in gold/tan. The controls for the headphones are on the right ear cup. Two buttons are for raising and lowering the volume, along with a button for pairing Bluetooth, which also works as a button to play and pause the audio source. The headphones are switched on and off by a sliding switch. A micro-USB charging port and a standard audio jack are also found on the right ear cup. The makers say the Bluetooth has a range of about 9 meters (30 feet). Once fully charged you can expect the headphones to operate for about 18 hours listening via wireless. Users have described the sound quality as excellent, and far superior to other headphones designed specifically for children. One point that should be made is that when using the audio cable provided the volume limiter only works if it is plugged in the correct direction. Check the instruction manual for details. If you are a budget conscious parent of a bigger family, then the LilGadgets Untangled Pro is an option worth considering. These Bluetooth headphones have the ability to gang two or more headsets together using a cable so more than one child can listen to the same music. These headphones could be ideal for a family on a long car journey. The LilGadgets Bluetooth headphones have the volume limiter integrated into the device which allows the volume not to exceed 93 decibels. This is a little louder than others we are looking at, but the headphones do have 13 decibels of passive noise isolation. The noise isolation does work well but is not enough to remove all of the background noise. The headphones have been made tough enough for any active kid, and has a headband made of stainless steel and ear cups made of polycarbonate. However, some users have reported that with active use, such as being dropped multiple times, the ear pads can detach from the ear cups. The audio cable is nylon coated and is tangle resistant. In tests it held up moderately well to abuse. And if something is not quite right, the headphones do come with a one-year warranty. Fabric covers the earcups and the adjustable headband giving the headphones a soft feel. 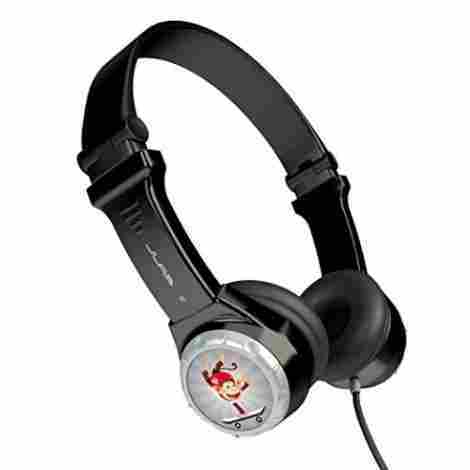 The makers say the headphones are suitable for kids from the age of four and older. What makes these headphones different from so many others designed for kids is what is called the ‘Shareport.’ A 3.5mm jack is located on each ear cup. This allows a number of headphones to be connected together, sharing the same source of audio source, meaning you can connect two or three headphones to a single mp3 player or phone. This sharing option only works when the headphones are plugged into the audio source, and does not work with Bluetooth. The volume control is a slider on the right ear cup, along with a charging port and Bluetooth pairing button. The makers say the LilGadgets Untangled Pro can provide in the region of 12 hours of Bluetooth audio listening on a single charge. Users describe the sound quality as good, although not of audiophile quality, but few kids are looking for that level of audio. Coming with a lifetime guarantee what’s not to like about the Jlab Audio Jbuddies Kids headphones. These budget-priced headphones come in non-folding, and folding versions, with six different color combinations, and eight 3-D stickers to customize the ear cups. The simplicity of the headphones also includes the volume limiter. Unlike other headphones which need electronics or a special cable the limiting to 90 decibels is automatically done inside the headset. The earpads provide some passive noise isolation, but these headphones are designed to be worn on the ears rather than over them, so it’s never going to block a great deal of noise from the outside. As budget headphones the headband and ear cups are all made of plastic. There is enough flex in the headband that should not be expected to crack or break with regular use. The folding version hinges at the ends of the headband, and if bent sharply could be its weakest point. The makers say the headphones can be worn by children from two years or older. However users say they are more appropriate for kids aged between 4 and 14. As with all of these types of headphones it goes more my head size than age. The volume is easily controlled by a large round dial on the left ear cup, and the maximum is limited to 90 decibels. In tests, the sound limiting appears to be better than the manufacturer's specification with attenuation down to 80 decibels. The all-plastic construction does not offer the deeper bass tones from the top selections. A soft carrying pouch is provided rather than a hard case. If you’re looking for headphones to fit the smaller head sizes of a toddler, then have a look at the LilGadgets Connect +. The important volume limiting is permanently built into the headphones with no need for electronics or adapters. To keep the ears of your children safe the manufacturers have set the maximum volume at 93 decibels. There is also 13 decibels of isolation from ambient noise. This is ok for most household situations, but if you are in a noisy environment, such as an airplane the headphones may not be sufficient to block out all the outside sounds. The hinged headband means the headphones can compact when not in use, but this can also be their weak point. Users have pointed out that if the headphones are subjected to too much twisting, they have a tendency to break. However, if carefully used there should be no immediate problems with their durability. The headband and ear cups are well padded and comfortable, and along with their relatively light weight are good starter headphones for toddlers and younger children. The makers say the headphones are suitable for kids aged from 2 years to 8 years, but that might be stretching it as older children might find them a little too snug. The headphones feature the LilGadgets SharePort system, with a 3.5mm headphone jack in each ear cup. This allows more than one child to listen to the same audio source but attaching an audio cable between the headphones. The audio cable supplied is one of the longest reviewed at 52 inches (1.3 meters). Unlike other headphones, the volume controls are not on the ear cups of the LilGadgets Connect +. If your child turns up the volume of their listening device, the headphones automatically limits the volume with no further input from child or parent. The sound quality is above average for such a small set of headphones, and are superior to many designed for adults. The Connect + headphones come in a wide range of colors and come with a soft microfiber carrying pouch to protect them when not in use. If your kids are high flyers and do a lot of traveling, then you and they will probably love the Onandoff Buddyphones Inflight. What makes these headphones unique is they have three volume level limits, which can be set for different environments. A headband that folds and a sharing port give the Inflight headphones the functionality any young traveler will appreciate. The maximum volume on the headphones can be set at 75, 85, and 95 decibels using a tamper-resistant dial on the side of the ear cup. The highest setting of 95 decibels is best used when traveling on an airplane, and the others for quieter environments, with the 75 decibels suitable for home use. Parents have said the dial is tricky to operate at first and takes a couple of times to get used to. The headband on the Buddyphones Inflight headphones is flexible and can twist and bend with little chance of breaking, making them very durable. 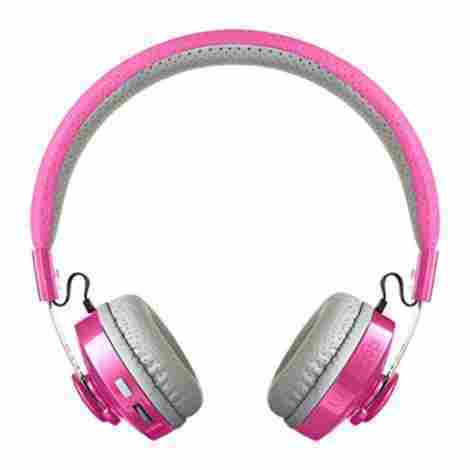 However, with all headphones with hinges, these can be the weak point and can break if overstressed. 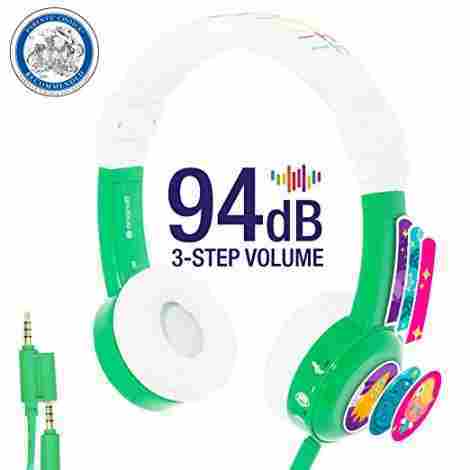 Although the makers recommend these headphones for kids aged from 3 to 10, younger children and those with heads of a smaller size may fine the flexible headband is a little lose and is not as tight as it could be. The Inflight headphones come with a flat tangle-free audio cable, but it is a shorter than most of the others we have looked at, at only 31.5 inches (0.8 meters). A splitter is provided so a single audio device and be connected to up to four Buddyphones, and there is an airline audio adapter included in the kit. Unlike other kid’s headphones, the Buddyphones Inflight has an in-line microphone with the added functionality of play/pause/call buttons so it can be used with a mobile phone. The headphones come in a variety of colors, and each has a pack of six stickers to give kids the chance to customize their own headsets. The sound quality is good enough for most situations, although there is no great booming bass you get with some of the more expensive models, but for a set of travel headphones for your kids, you can’t go wrong. These budget-priced extra-lightweight headphones come from a major manufacturer with a proven track record in sound quality and can be used by adults as well as kids. The Sony MDR-222KD children’s headphones are one of the cheapest for kids, and obviously some compromises have had to be made. The volume limiting is based on the resistance in the audio cable to the headset. That means it cannot be turned off or bypassed. Some users have suggested that the volume limiting is too good, and these headphones are best used in a quieter environment. The volume available may not be able to make up for a noisy situation such as onboard an aircraft. The extra-lightweight construction means there is not very much passive noise isolation, so people around the listener are likely to hear what is being played by the child. To make these headphones ultra-lightweight the headband is made of thin plastic, and although of decent quality, will not stand up to harsh punishment or lack of care. If you are looking for a pair of headphones to be used around the home, then the durability and quality offered by the MDR-22KD should suffice. However, if you are looking for a pair of headphones for traveling there are better options available. As the headphones only weigh 1.84 ounces (52 grams), they are very comfortable and can be worn for extended periods of time, but the foam earpads have a tendency to tear over time and need to be replaced. 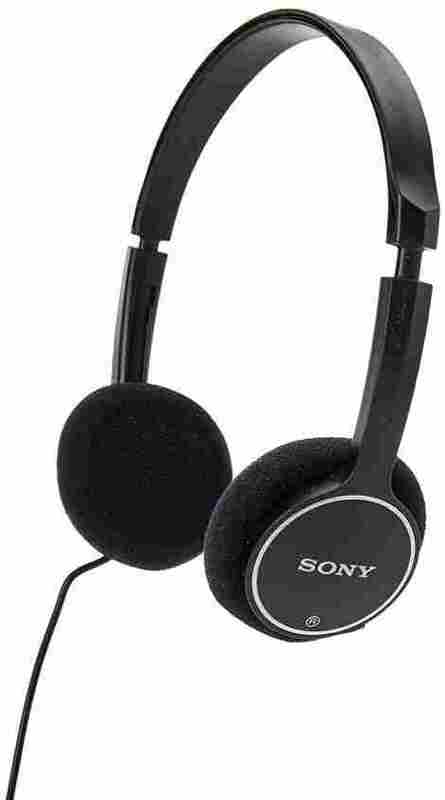 Sony recommends these headphones for children from aged 8 and older, and in fact, they can be used by adults just as well. With a more open feel, they do not make your ears feel hot and sweaty when worn. The quality of the reproduction of music has been described as muddy and lacking the full range of low and high frequencies, and this can be put down to the lightweight construction, and probably the fixed volume limiter in the cable. The cable is long at 47 inches (1.2 meters). With just two colors to choose from, pink and black, there are few options. Not every child feels comfortable wearing headphones, so here is an alternative that will keep any kid happy. 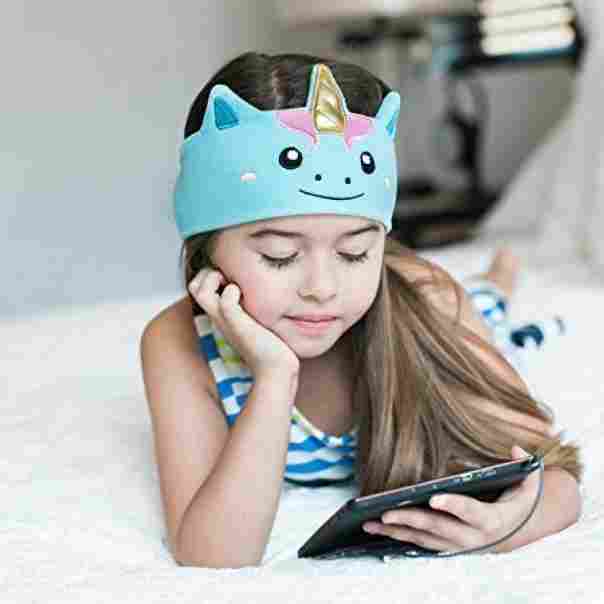 Ultra-compact and extremely comfortable, the CozyPhones Kids headphones headband should be ideal for toddlers thanks to its durable and simple design. These headphones have been used to help kids with SPD (Sensory Processing Disorder). According to the makers CozyPhones the headband headphones have a built limiter which sets the maximum volume at 85 decibels. However, some parents say they thought the headphones were a little louder due to the power coming from the audio source. As the headband covers most of the ears, it does an excellent job of blocking out ambient noise. One of the great points about the headband is that there is very little to go wrong, so the headphones are extremely durable. The soft headband is made from a fleece fabric, and the impressively thin headphones can be removed when the band needs to be washed. The braided audio cord is one of the longest at 52 inches (1.3 meters). Considering the headphone speakers are encased in fabric, the sound quality from the CozyPhones Kids is pretty good, although you do lose some of the bass because of the material. 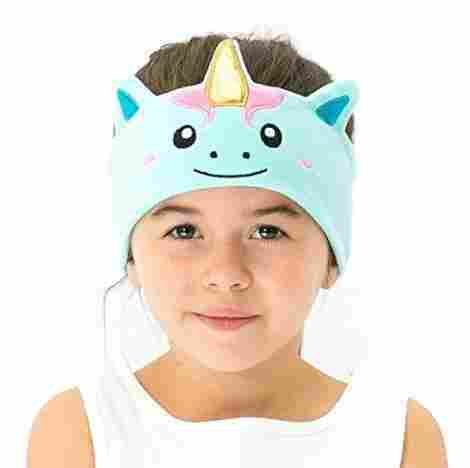 The headband comes in a range of vivid colors with playful motifs such as the blue unicorn, and the purple frog, which kids adore. These are probably the headphones your kids would never grow out of. The classic split-headband design means the Kidz Gear Wired Headphones are fully adjustable for children as young as two up into their teens. The over-the-ear style gives good passive noise isolation and being lightweight make a great choice for traveling, especially on planes. Volume limiting comes in the shape of a cable adapter that can be removed for more noisy environments. For everyday listening the limiter reduces the volume from the headphones by about 20 percent, this equates to a maximum volume of around 80-90 decibels. The manufacturers don’t specify how much volume limiting is achieved, and users have remarked that each adapter appears to have different levels of attenuation. However, with the larger earcups and soft padding ambient sound isolation is great and they do a good job of masking outside noises. 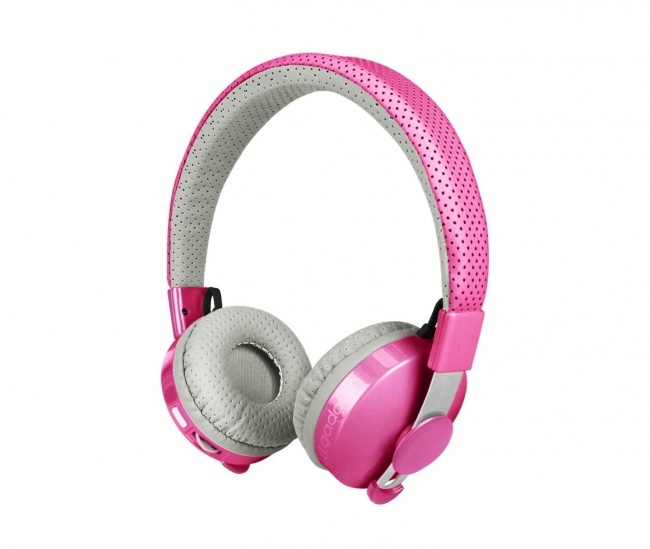 The classic design has the audio cable splitting in a Y-shape and running to both earcups. This means there is no cord running across the headband to worry about snagging and getting pinched or broken when adjusting the headphones for a good fit. However, at 1.5 meters long the Y-cable does tend to tangle more easily. Each earcup has its own plastic slider so the headphones can be adjusted to fit most kids’ heads. There is an in-line volume controller that works with most standard audio devices. The sound is surprisingly good for headphones that come at a budget price. This is partly due to the great sound isolation you get from the soft plastic earcups, which make these headphones ideal for traveling. 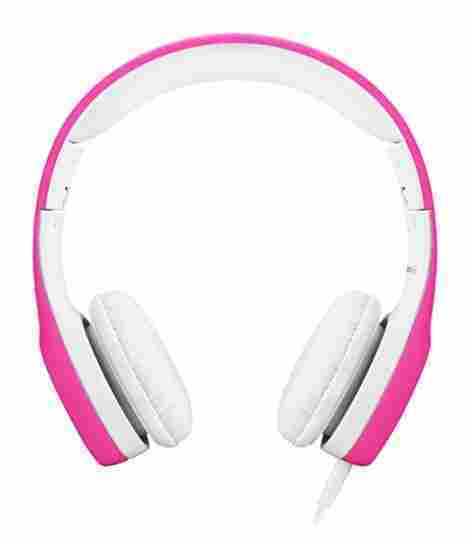 The makers offer the Kidz Gear headphones in a variety of bright colors but do not provide a carrying pouch or case for storage when not in use. For a product that fits a wide range of children, the manufacturers offer a limited lifetime warranty, which says something about the quality of the product. How Do Kids Headphones Differ from Adults? The most noticeable difference is the size and fit. Most kid’s headphones are designed to fit on the smaller head of a child. If the headphones are too big for a child, then they will be uncomfortable, dangerous and the sound quality is likely to be poor. Kids will constantly be adjusting, and they’ll soon tire. Kids headphones also come with a volume limiter to make sure their ears are not damaged by too high volumes. Can I Get Noise-canceling Headphones for Kids? There are no noise-canceling headphones on the market at the moment for kids. 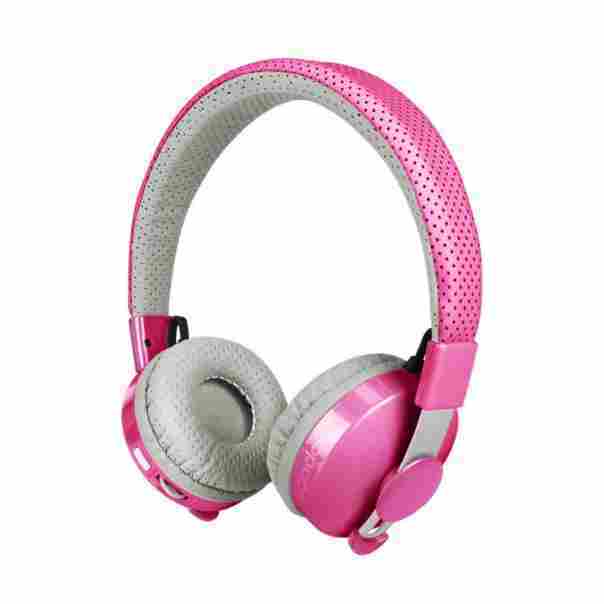 This type of headphone technology is relatively expensive and is not something that kids are looking for. What Is the Best Listening Volume for My Child? If your child is going to use headphones for extended periods, medical professionals recommend that they listen at no more than 85 decibels for one hour, for adults, this is eight hours. If the volume level is up to 95 decibels, then the listening time should be reduced to just a few minutes. Anything over that could harm your child’s hearing in later life.